I had one of these and sold it in 2006 for $600. Big Mistake! Won the bid for the current one a few days ago and fired it up today. Pushing JBL 4412 Studio Monitors is a breeze for this beast. The pure power and depth are breathtaking. Literally sounds like you are in the studio with the band. I won't make the mistake of giving it up again. Wow! 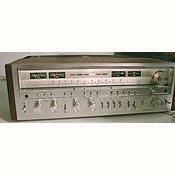 I have a Pioneer SX-1280 That is one of many that was on it's way to the dump, thrown in the back of a pickup, the guy stopped by my place thinking I might need some parts. What an awesome sounding amp. At 74 I finally got the system I could never afford, I am truly blessed. I can't say anymore that hasn't already been said about this equipment. I might add in the pickup was a set of Bose speakers, awesome. Bought my SX-1280 new in 1979 as a top quality solid state technology receiver/amplifier. I was initially relactant to accept it as a replacement to tubes sound quality, but the SX-1280 has proved it was almost there. Had it couple times failed to turn on. I found out on both times I had to replace all 4 diodes in the power supply. Since I used 1N4004 diodes in the repair, this problem never came back on again. My son offered to burry me with my SX-1280 in my 83 Volvo when I die! My Sx-5590 looks the similar but its black with silver trim .It drives my Altec tri-flex speakers which have 20" woofers, mid range and a high range tweeter. I love this system. I bring it to an authorized Pioneer dealer to have it tuned and tested every couple of years. While its there they do what ever upgrades that are required. Its 120 or 240 volt and rated at 1200watts and an output of 160 watts per channel. I bought my SX 1280 over the past weekend. I must admit, I wasn't in the market for one. I was in the market for a McIntosh but the one I was after was on hold for someone else. Then I saw the ad for the SX1280 with a picture. The picture is what caught my eye. What a beast, it was huge, and it was beautiful. The price was pretty high, higher that the Mac I was after. I did the research and found out it was one of the monster receivers from the eighties, putting out 185 wpc. Wow that something. I thought I'd take a chance, and Im so glad I did. I love this receiver. What power. The purchase of this created a chain reaction. The speakers I had really couldnt handle this reciever. I had B&W DM 220's. I had bought them to go with a lower powered Mac. But even at lower levels the B&W's couldnt handle the power. The next day I went out and bought a set of Yamaha NS. A match made in heaven. Such power. Such sound. Its literally music to my ears. I doubt I'm giving up any sound quality by not buying the Mac. Afterall it couldnt get any better! If you have the chance to pick up one of these, dont even bat an eye. Buy it, you wont regret it. My dad gave this to me 25 years ago. It still blows the doors off of everything today. Its built to last!! I originally came into possession of this fine piece of gear around 1996, at the time when I had no clue about vintage gear, especially "Pioneer". And working for a Mid/Hifi shop at that time (B&W,Snell ,Adcom,PS Audio, Cal Labs, Nakamichi, Parasound, Lexicon etc. etc. ), Pioneer was considered "low-fi". I couldn't believe my eyes when I first saw it, and did an immediate double take. Curiosity overwhelmed me, so I paid the $125 and took it home. I remember dragging this beast into my store, and hooking it up to a set of Snell C/V's. What amazing power this thing had, and without breaking a sweat. I played around with it for a few months, and gave it up to the old man, whose venerable cabinet stereo from the 60's had recently gave up the ghost. After some listening sessions with me, he ended up choosing a set of Snell J IV's based on his taste and budget. As time progressed, I had purchased and resold various products, never satisfied, and to my fathers amusement of my "audiophile-nervosa" explained that he was still enjoying his system. About 7 months ago, I became re-acquainted with this under the most undesirable circumstances, my father had passed away. Part of the grim experience of loosing one's parents, is what to do with everything they have accumulated over an entire lifetime. However, sparing you all of the sorrowful details, I knew that his stereo he so enjoyed would find a good home with me. I put it in storage, with the thought of making some room for this in my home someday. So I did. I hooked it up the ol' girl with the Snells and an old Parasound CDP1000 I had kicking around. As the lights in the room lightly dimmed for a split second, from the huge current draw, I was transported back to those years that passed by. The warm lights from the tuner section increased the level of nostalgia, and I couldn't wait to listen. This reciever offered up, on every recording, music that sounds like what i would expect from the best components available that service my taste- Sound that is silky smooth, vocals that are natural and eerily real, bass that is powerful and well controlled. No matter what I tossed at it, jazz, classical, rock, r&b, pop, and electronica , everything maintained its full integrity without disappointment. I would recommend "The Ultimate Demonstration Disc" from Chesky Records for some serious critical listening. If you get your hands on this CD, listen to it alot, learn it and know it. It's really great for comparing gear. I was pretty impressed in all areas of this music with this current setup, but what stood out the most in my opinion were two separate pieces of music. The Focus Test using "Flute Concerto in D", Vivaldi, performed by The Connecticut Early Music Festival Ensemble was absolutely awesome. It was amazing how well focused the flute was held in space, as well as the placement of all the instruments. But the biggest WOW came from the Dynamic Test. This solo drum jam was just amazing (use with caution! ), it's hard to believe how this all held together, even on such diminutive tower speakers. Every skin hit and symbol crash was presented in all its splendor, without any strain (well, within the framework of what I was willing risk, and I can assure you that I'm not willing to damage anything that isn't easily replaced!). This kind of power, based on my past and present experience, is a testament to where this amplifier section really shines, and truly compares to separate amps that will run you in the range of a couple grand today. As far as the rest of it goes, the pre-amp section is really busy. In grand scheme of things, its not what I would consider an absolute purist design by any means, with all the tone controls, loudness switch and muting. At least all of this is defeatable if you so desire, which does give way to a purer signal path ultimately. However, this allows for a much greater chance of wear, if played with alot, and also opens everything up for dust and dirt. So don't be to surprised if you happen to loose a channel temporarily due to dirty switches that get crapped up over 30 years. I'll admit, at times, these controls can be fun features when used properly, and it really shows that Pioneer want to go all out and give its customers everything. The tuner section is sweet! Pulls stations well, and there is a mono switch in the preamp section which is great when you cant get a clear stereo signal. Now THAT is handy. Also worth mentioning, is the build quality of, well, everything. It doesn't look like expense was spared in the piece. The tuner section, knob etc looks jeweler quality. The walnut wrap gives it a luxurious look, and the massive amplifier section which takes up the entire back half of the receiver looks well laid out symmetrically, with its huge toroidial transformer, large caps and external heat-sinks. Pioneer SX1280 receiver. I had one of these from 1985 - 1994 when after many great years it developed an inconsistant fault which made it switch off. From 1985 - 1991 I used in in a CD based disco operation and many people said it was the best sounding disco they had been too. I used it with a set of studio monitors at home and yes records in excellent condition and the player having an excellent stylus do sound better than CD's However well recorded CD's are fine. Live is almost always best though. 185 watts per channel into 8 ohms right down to DC. Ultra low distortion. Dual bass and treble contour controls. Quality, high stablity and high sensitivity MOSFET FM tuner. Warm "vacuum tube like" sound. Solidly built. Tuner could use a switchable bandwidth feature for better fringe area performance, but this is a minor drawback. The thing weighs about 78 Lbs. Controls and switches get noisy with age, and are difficult to clean. This Receiver was just about state of the art in 1979 when I purchased it. With a fantastic power bandwidth from 0 Hz to beyond audibility and probably almost a NASA quality tuner, and a plethoria of inputs, outputs, and other features, there was almost no limit to what all you could connect to this thing. When you're listening to an LP with this unit, every nuance in the recording comes to life with awesome clarity and transparency, With a CD player, the 1280 reveals the clarity as well as the flaws of the 16 bit 44.8 khz sampling system. Listen to a SACD (Direct Stream Digital) and you are blown away by just how sweet recorded music still can be. This receiver delivers on all the printed specs that came with it, and the bottom line is warm natural sound, solid thunderous bass, silky highs, and the ability to handle any speaker system that you can attach to it. I am presently using two pairs of stacked Advents paralled to present 4 ohms to the amp. It doesn't even grunt, and yes it will remove objects placed on nearby shelves when you crank it up. I am just as pleased today as I was when I purchased it in 1979. Although, by present technology standards, this thing is probably considered a dinosaur, It's solid design and high quality components still cranks out sound that outclasses anything available today. It still looks handsome, to boot. At this point in it's life, it resides in my home office somewhat married to the sound card output from a PC. I record now only digitally, and the 1280 is a fantastic monitor for some of my LPs that I have made into CDs. Yes, you can hear a difference between digitized audio and it's analog source. The LPs still sound better. SACD, on the other hand, does have that full warm sound, and even though I'm only using two channels (SACD is 5.1 capable), the sound through the 1280 is fantastic. Although I now have a multi-channel surround system, this one is still my first love, and I won't be parting with it anytime soon. The way Pioneer built this thing, it may outlive me!